Mobile communications touch every corner of the world, and billions of people are connected via mobile devices every day. There are complex networks behind the connections, making everything work seamlessly and helping us stay in touch with our friends and families – and business partners. Mobile backhaul is at the heart of the operator’s network, providing connectivity between base stations and the core network. The increasing demand for data-intensive services and content such as video streaming and mobile gaming requires a robust and cost-efficient backhaul solution. Let’s take a closer look at how Nokia is approaching this. Today’s mobile backhaul solutions are built utilizing both fiber and microwave technology. Continuing on the footsteps of our strong partner ecosystem in the IP routing domain, we have now built a Microwave Backhaul Ecosystem of partners for a true end-to-end portfolio. We can tailor our solutions based on unique operator needs and preferences for certain vendors and technologies. Our partner products in this area cover the entire microwave spectrum from 2 to 80 GHz. "With its partnering approach, Nokia is building on a foundation that opens up new areas of opportunity. 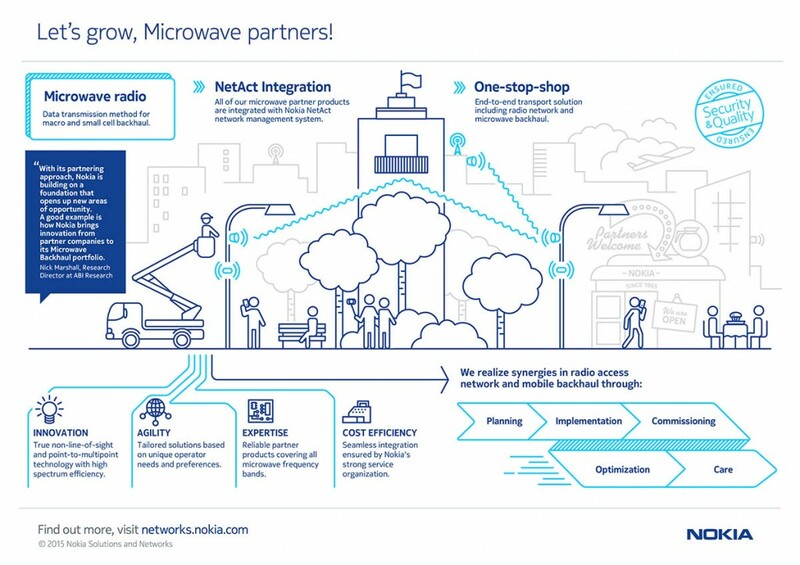 A good example is how Nokia brings innovation from partner companies to its Microwave Backhaul portfolio." * DragonWave, for a complete microwave portfolio including non-line-of-sight performance and high spectrum efficiency. One of the recent results of our technology cooperation is a BTS transport plug-in card for zero footprint solutions. We also continue to cooperate in the field of small cells. * NEC, for a full menu of microwave and millimeter wave radio technologies to address the challenges of operators for high capacity, high efficiency and total cost of ownership reduction from last mile to aggregation networks. * SIAE MICROELETTRONICA, for microwave and millimeter wave radio systems, field proven in 2G/3G/4G networks worldwide, fitting for IP and TDM, as well as high-speed Gbps LAN-to-LAN interconnections. Recognized on the market for its completeness, the portfolio includes RF Multicore, full outdoor aggregators and benchmarking performance for power consumption. At Nokia, we believe that one company is not able to build complete solutions for mobile operators with products developed in-house. As Thorsten Robrecht wrote in his previous blog post, we've started a new era of collaboration. We involve our Microwave Backhaul Ecosystem – and also companies in other areas of expertise – to create innovative solutions with unparalleled quality and flexibility. And we do it fast, making it possible for the operator to launch network improvements faster and with greater cost efficiency. All so that mobile customers can enjoy improved quality of experience with low latency and high throughput, especially important for video streaming and mobile gaming. Together with our Microwave Backhaul partners, we offer a selection of certified products with capabilities that help tackle different implementation scenarios. Our partner ecosystem certification guarantees that our end-to-end solutions have the same standards for quality and security as our own products. For easy operation and maintenance, all of the partner products in these solutions are integrated with our NetAct network management system. Nokia’s strong service organization ensures seamless implementation of the radio network and the microwave mobile backhaul. To put it shortly: Nokia is offering operators a one-stop shop for end-to-end transport solutions including Microwave Backhaul, helping them create trusted and stable connectivity for today’s mobile lifestyle. We have more to share on our partnering strategy here, Mobile Backhaul products here, and Microwave Transport here. Read SIAE MICROELETTRONICA’s press release here, and DragonWave's press release here. And please share your thoughts by replying below – or join the Twitter discussion with @nokianetworks using #NetworksPerform #mobilebroadband.